Derek Daly has signed for Waterford FC from Chesterfield, the League of Ireland First Division side has confirmed. The young winger, 19, cited first team opportunities as a key factor in the move to his native Ireland. 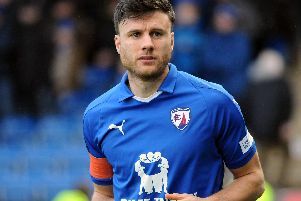 Dublin-born Daley has featured twice this season for the Spireites after signing a pro contract in 2016. Speaking on the move to Waterford, the former Republic of Ireland U16s international said: “I’m happy to be back in Ireland to sign for Waterford ahead of the league kicking off this weekend. “Hopefully this move will be a good opportunity for me to get some game time and show my ability which I feel I haven’t really had the chance to do the past few months. “Waterford are a strong side with great aspirations of getting promoted so for me, to get that experience at 19 is an opportunity I couldn’t turn down. Daly played his youth football with Dublin-based side Cherry Orchard and graduated from the Spireites academy. He spent time on loan at Sheffield FC and Frickley Athletic and is pictured above playing for Chesterfield against Wolves in the Checkatrade Trophy in August.